and check on the Dylan story, you'll get the scoop on the dirt. 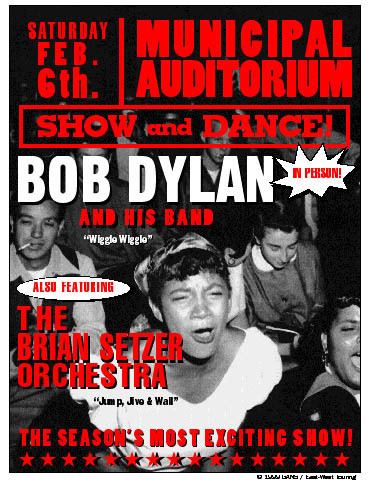 Brian Setzer is responsible for the album The Dirty Boogie and Bob Dylan is dirty right before he showers, so the connection is obvious. Even with knowledge of these spooky similarities, it's a bit strange that one man known for jumpin' jive and another who's known for wailin' would hit the road together for a three-week tour, beginning Jan. 26 in Fort Myers, Fla. The thirty-nine-year-old Setzer will undoubtedly feel like a young man when he and his orchestra accompany the fifty-seven-year-old Bobfather of Rock on a fourteen-show swing through smaller-market cities in the Southeast, such as New Orleans, Birmingham, Ala., and Nashville. The tour concludes on Feb. 15 in Cedar Rapids, Iowa. 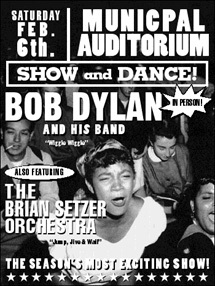 Once this string of dates is wrapped up, Setzer will likely begin a new tour in Europe, while Dylan will either continue on with another act or take some time off. Feel like a trip to Nashville anytime soon? > Feel like a trip to Nashville anytime soon? never been to Nashville and have always wanted to go. So it kinda went from there. As long as we're in Nashville, might as well visit Memphis, which is so close, it's practically in the same state. As long as we're renting a car to drive to Memphis, might as well visit New Orleans, which isn't a lot further. Hey, between Memphis and New Orleans is the Mississippi Delta, which is where all that music came from anyway.